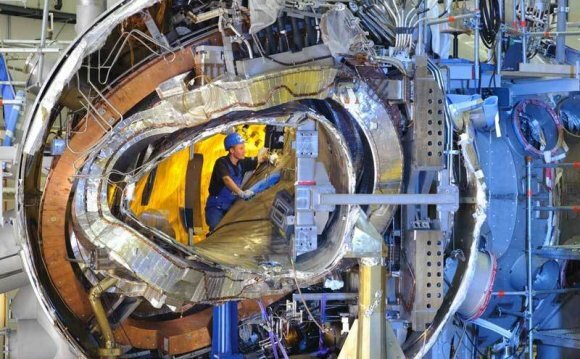 This is an invention that might change civilization as we know it: A compact fusion reactor developed by Skunk Works, the stealth experimental technology division of Lockheed Martin. It's the size of a jet engine and it can power airplanes, spaceships, and cities. Skunk Works claims it will be operative in 10 years. Above: The traditional Soviet tokamak design of the International Thermonuclear Experimental Reactor, a gigantic installation being built in France. Above: The Skunk Works' new compact fusion reactor design. [The traditional tokamak designes] can only hold so much plasma, and we call that the beta limit. [Their plasma ratio is] 5% or so of the confining pressure. We should be able to go to 100% or beyond. It's one of the reasons we think it is feasible for development and future economics. Ten times smaller is the key. But on the physics side, it still has to work, and one of the reasons we think our physics will work is that we've been able to make an inherently stable configuration. In our case, it is always in balance. So if you have less pressure, the plasma will be smaller and will always sit in this magnetic well. But we all know that the road to the dream of clean, unlimited energy is paved with failed inventions. The situation here seems different. First, Lockheed Martin is not a crazy dude working in a garage. It's one of the world's largest aerospace and military companies.